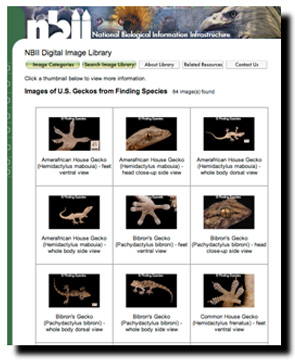 Finding Species has partnered with the U.S. Geological Survey, NBII Digital Image Library to build two Special Collections of approximately 2,000 biodiversity images for public use. 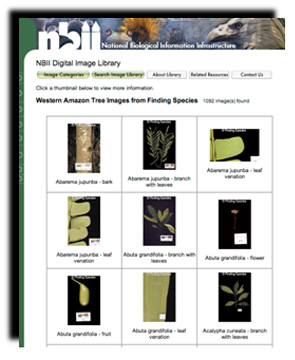 Users of the NBII library are able to easily and quickly search for and download these images and use them for non-commercial purposes at no cost. The library contains well-documented images associated with plant and animal species, landscapes, wildlife management and biological study/fieldwork. 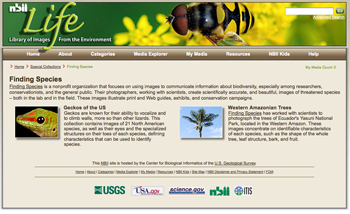 The mission of the NBII Digital Image Library is to develop, grow and provide a digital library of biological, photographic images - offering a rich, Web-based resource of high quality images dynamically linked to associated metadata accessible and available to scientists, conservationists, decision makers, educators, students and the general public worldwide. Copyright 2016 © Finding Species. All Rights Reserved.